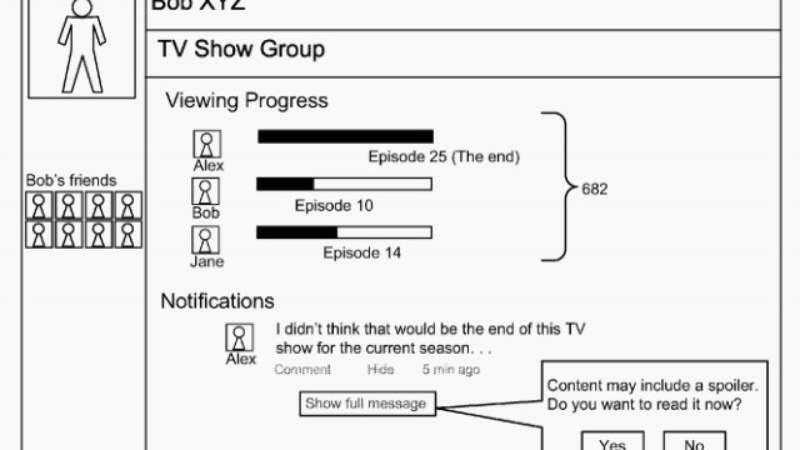 Google recently secured a patent on a system that would block social-media content containing spoilers for TV shows, movies, and even those units of bound pages that you dimly remember from high school. And rather than force us all to navigate the U.S. Patent and Trademark Office website, Quartz has kindly distilled the information with an article that starts off by revealing the endings of Citizen Kane, The Sixth Sense, Breaking Bad, and season three of Game Of Thrones (sort of) for no discernible reason other than that the writer thinks it’s cute. So, if you don’t want to know what happens at the end of those, you might want to stick with our coverage. The system would allow users to track their progress with particular entertainments via a social network. Then, Google would use that information to determine whether other users’ posts contain potential spoilers. If the system suspects a spoiler, it will blur out the content, create a pop-up warning, and ask users if they want to read the post. Users could also aid the system by flagging content that others might consider spoilers. At this point, it’s unclear if Google would integrate the system only into its own social network, or if it would also work with social-media platforms like Facebook and Twitter that people actually use. In fact, implementation of the system isn’t even guaranteed at this point, as a Google representative said that some patents “mature into real products or services and some don’t”—probably right before revealing the ending of The Beautician And The Beast.